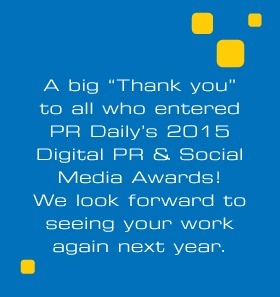 Congratulations to the winners in the 2015 Digital & Social Media Awards! Our judges named the finalists. Now, they have named the winners. The very best work in the 2015 Digital & Social Media Awards. These winning entries demonstrated creativity, innovation and brand building brilliance. Their work impacted companies and careers and made a difference in the way we communicate. We thank everyone who shared their work with us and look forward to reading about the amazing entries in next year’s program. Please take a moment to read what made the winners’ work extra special in the eyes of our judges. Join us in congratulating the winners of the 2015 Digital & Social Media Awards!